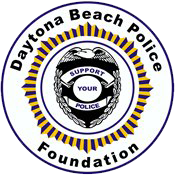 The Daytona Beach Police Foundation (DBPF) was established in 2007 under the direction of former Police Chief Mike Chitwood. The DBPF is a donor-advised fund of the Community Foundation of Volusia and Flagler Counties, a 501c3 organization that raises money through donations and fundraisers throughout the year. The money that is raised is used specifically to purchase equipment and training and education opportunities for Daytona Beach police officers. DBPF is organized and administered entirely by citizens and volunteers on its board of directors. For more information, please visit the Daytona Beach Police Foundation's website. For credit card payments, please call (386) 253-0563 . The private sector has a real stake in the success of the Daytona Beach Police Department and the safety of our city. The DBPF serves a vital role, connecting private investment dollars with effective public safety solutions. The Foundation is engaged in an effort to leverage private resources to fund high priority law enforcement needs. DBPF’s scholarship fund is a prime example of how the funds are being used. Promotions within the Daytona Beach Police Department are tied to educational attainment. As a result, officers are encouraged to pursue degrees from associate to masters. To help officers attain their educational goals more quickly and affordably, the DBPF will provide officers with tuition assistance from the scholarship fund.